To kids, playgrounds are treasure, and the story of the last playground brings this message to our ears, our eyes, and our hearts. Children have been terribly affected by the war in Syria. Their schools and playgrounds have been bombed out of existence. The children are hungry, sick, and terrified. As they look around them, the world is shattered and broken. The Land of Childhood now has a ball court, playhouse, space for games, and even a ferris wheel. It’s not a very big ferris wheel and rather “make-shift”, but it keeps the spirit of play alive in the hearts of children. There’s a climbing frame, rocking horses, and a ball pit in this last playground. More volunteers have painted the dirt and rock walls with flowers and bright colors and strung colored lights to shine in the darkness. Here the kids can laugh and forget the horrors that await them above ground. For many, not only are their playspaces and schools gone, but their homes too. The lucky ones still have their parents. Despite this, children still play. How can they engage in such a ‘frivolous’ activity? To children, play is very serious. It’s how they connect to the world. It’s very profound. It’s how they express their hope in the future. Play is an expression of joy, and the children have not lost the capacity to find joy in bits of time and play. Maybe what the whole world needs is not war-zones but play-zones. Would that we could learn from the example of children. Peace through play? The cloudy weather cleared up and the sun came out so we headed outside for some Planet Playground fun. This can happen at any playground in most weather, but warmer days often mean more time outdoors. 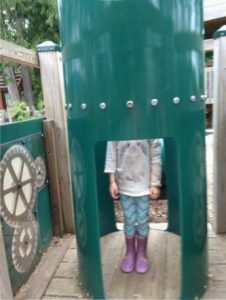 Since we’d been talking of outer space with the Jupiter probe Juno and the anniversary of the landing on the moon, it didn’t take much stretch of the imagination to turn a tube at the playground into a rocket. It’s too bad there isn’t a circle cut out anywhere on the tube so kids can see out, but they can certainly be heard counting down. A gear section on the outside served as the rocket launch controls. Little Sister ran from one to the other and then back again after each blast off. Big Sister came over to play too and they begged to have their photo taken. The easiest way to take a picture was from inside but with no room to back up, it’s a sort of bird’s-eye view of our feet. This time, the spaceship landed on a new planet and the kids made up different kinds of games as they explored all around. 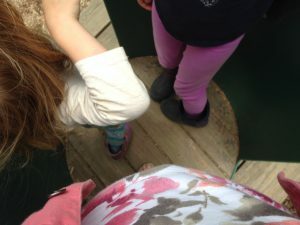 Time on the playground is certainly beneficial for bodies. Kids strengthen their large muscles as they climb, run, balance, wiggle, jump, swing, and engage in other actions. It’s also helpful for brains. To develop coordination requires the brain and body to communicate and work together. 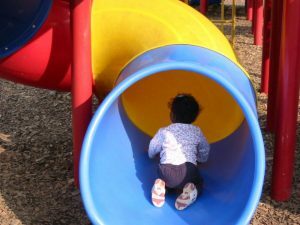 On the playground, kids challenge themselves to climb a little bit higher, stretch a little bit farther, and jump a little bit longer. Sometimes, we can see them preparing their body for an action as they get brains and bodies in sync. Do you know how to organize a space party? A. You planet. When it comes to what kids learn on a playground, we can’t “planet” but we can know fun and play is one of the best ways to learn. Can you organize some space in the day for planet playground fun for your child? 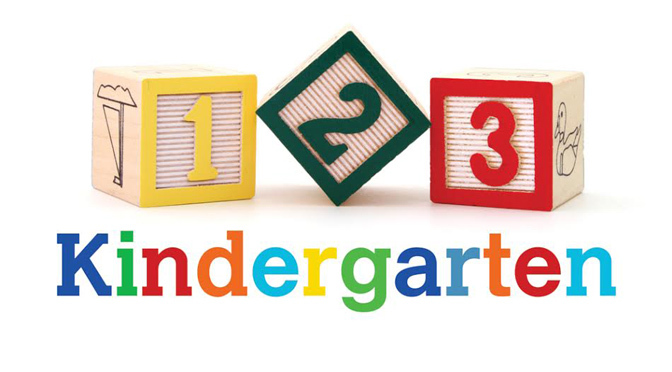 Transportation activities playground fun is today’s play-of-the-day. 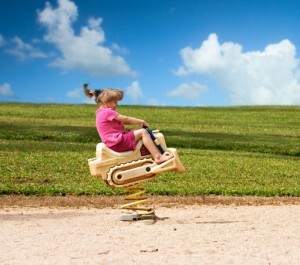 Is there a playground in your neighborhood close enough for you and your child? 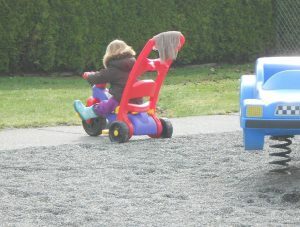 Most children’s playgrounds have some piece of equipment to do with transportation. 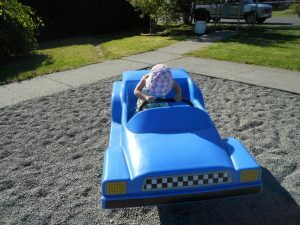 One of Little Sister’s favorite playgrounds is the race car park. There’s a small blue race car for bouncing just right for 1 or 2 kids. She also likes to ride her bike there and back. We go fairly often, on hot days and cold, and dress for the weather. In another playground, instead of a race car, there’s a bulldozer. Although kids aren’t building roads, they are certainly building muscle strength. 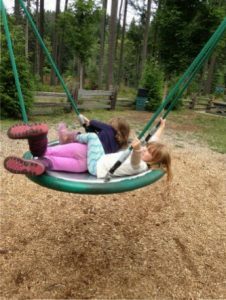 As kids play on equipment, they are also developing both an awareness of how their body feels as it moves and of the body’s position in space. 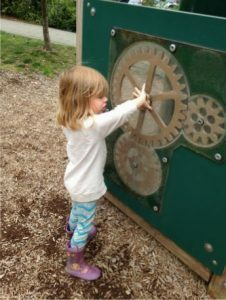 Playgrounds are also lots of fun for imagining. 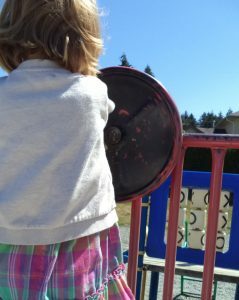 The wheel is another common structure on playgrounds. Kids can imagine driving a car or steering a bus. It could be the wheel on a ship or on a big truck. There might be a tunnel for trains. Although it sounds like a contradiction, imaginary play is one of the ways children interact with the world. They are trying out their ideas about the real world to see if they fit. Of course, they are also exploring fantasy worlds as they stretch what they know and think. Besides the physical and intellectual stimulation on a playground, there’s also social and emotional. Kids will test their own developing abilities and challenge their fears. Something that was too high, too scary, or too fast last week might be okay this week. On a social level, kids practice taking turns, sharing, and waiting. These are basic social and emotional skills that come into play. It really is a playground. Transportation activities playground fun delivers lots of learning too. 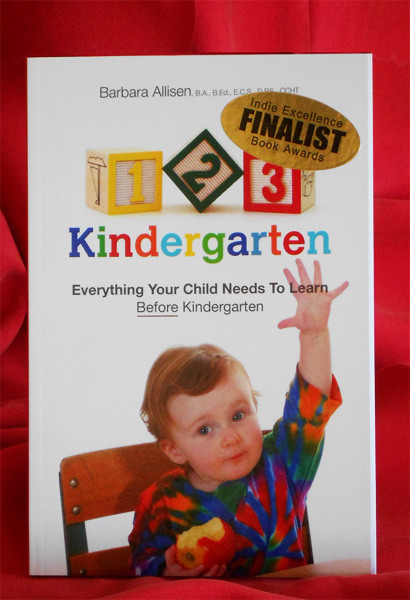 Could some time on the the playground be part of your child’s day? Here is a page of ideas for having some nature and sensory fun on the playground. 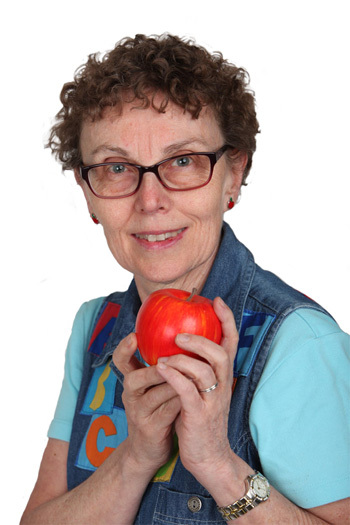 Movement activities are important to include in early learning because they connect many brain pathways. Enjoy!